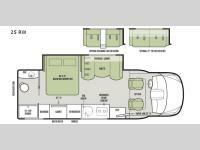 You will love the versatility that this Wayfarer diesel coach allows your family when traveling. With a queen Murphy bed/sofa you can easily make it fit your needs all while on the road. The large slide along the driver's side allows for plenty of space in this 7-1/2 foot wide model. No worries about when or where you will stop on any journey since you have all the amenities you need for any place you decide to make home right at your fingertips. A complete kitchen, including a two burner cooktop and microwave oven, make it easy to create meals and snacks on the go. The rear full bath is another great amenity featuring a 24" x 36" shower with skylight. For your little ones, you can easily use the booth dinette or choose the optional 70" tri-fold sofa/bed in its place, or there is the over the cab loft space that might be fun as well. In the loft area, you will find a swivel arm 32" TV that can easily be viewed throughout the coach. Another 32" TV in the Murphy bed area allows you to easily watch a move while it is set up in the sofa position, or while in bed.